Chum Passerelle, a collaboration between Cannon Design and NEUF Architect(e)s proves that infrastructure need not be boring. More often than not, the bridges and byways that consume so much of our urban space are built for function and nothing more. Especially in cities like Montreal, where civic pride and tourism are so dependent on the architectural richness of the streets, dull infrastructure can be a real visual downer. Alternatively, it can become a focal point. Local firm NEUF Architect(e)s, in collaboration with CannonDesign, has turned a potentially run-of-the-mill sky bridge between two glass towers into a powerful work of art. 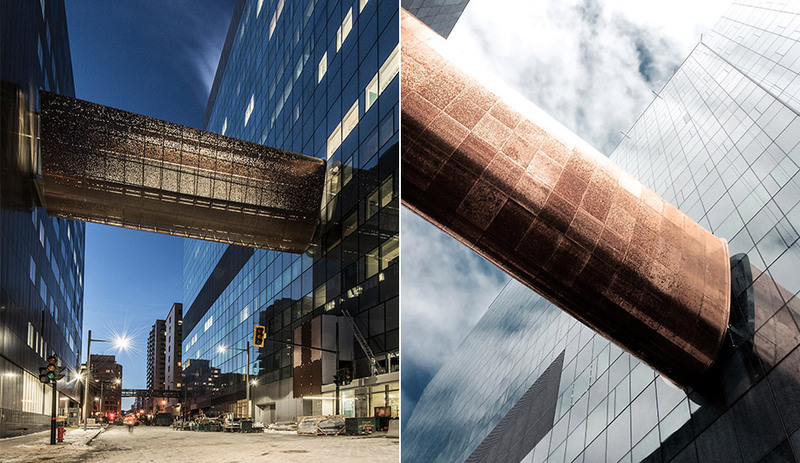 Called Passerelle, the street-spanning passage is part of North America’s newest and largest teaching hospital complex, and serves as a vital link between the Centre hospitalier de l’Université de Montréal (more commonly referred to as CHUM) and the university’s logistics tower. 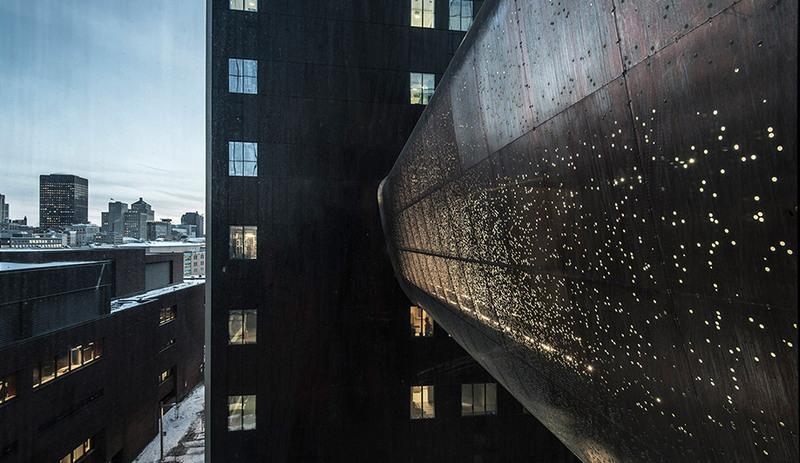 Floating 18.3 metres above the street, Passerelle’s curved, blimpish shape is clad in sheets of polished copper – a nod to the oxidized rooftops of so many of the city’s churches and cathedrals. 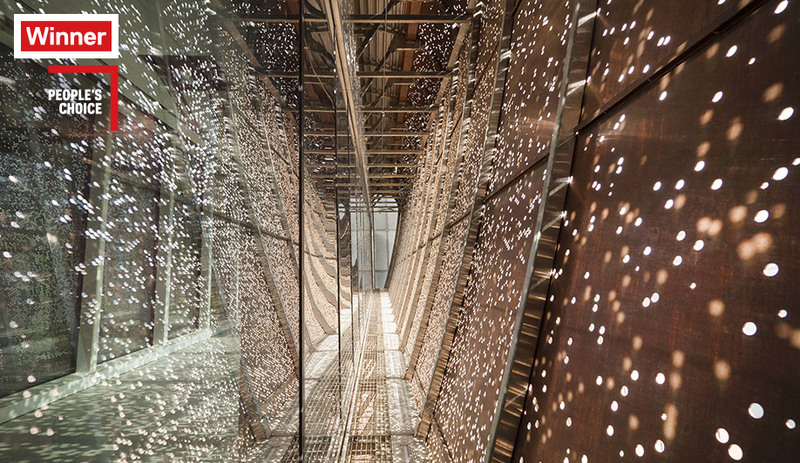 Some 197,838 holes have been punctured into its skin to let natural light pour in with a dappled effect during the day, and to lend the structure a celestial quality after dark. 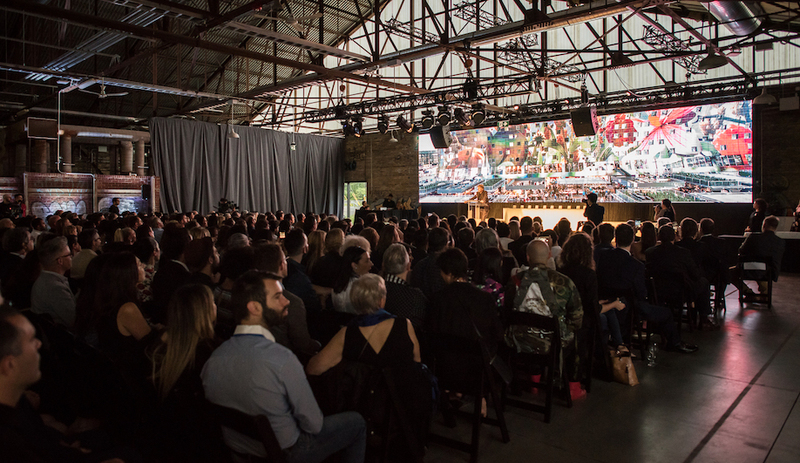 Nurses, en route from the blood bank in one building to the operating rooms in the other, now glide through Passerelle’s changing theatrical display with urgent deliveries of blood pellets. The actual structure – primary beams above a suspended floor – is concealed by a series of curved stainless-steel ribs that hold the copper in place. But it is the embedded LEDs that give Passerelle its starry-night drama, turning boring old infrastructure into a luminous asset.